Here's a patch file that should hopefully fix the resurrection mini-dumps. This file doesn't include any meshes, textures or sounds. The full version is being uploaded on moddb but is a much larger download. Nice.. thanks Z. I'll download it now and let you know what I think. 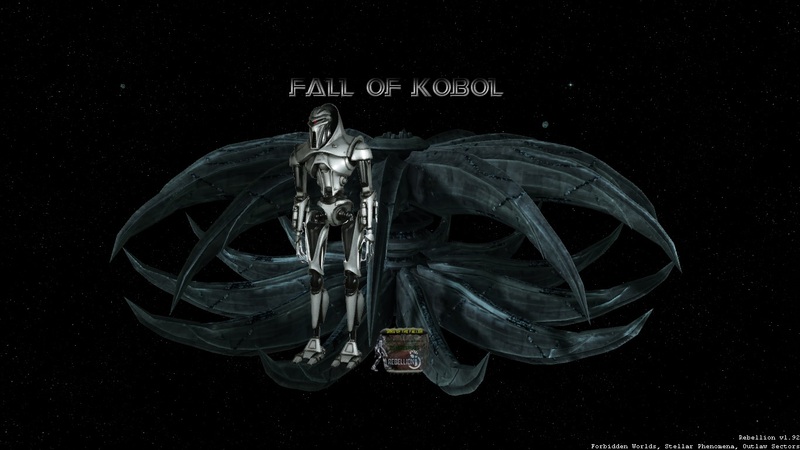 Fall of Kobol! - Multiplayer madness! Hi guys, the forum have sort died here. Moving to CGB's discord for discussion where there's quite a few sins players. That discord invite seems to be expired. Also, the new version is great, just played it- although, I sort of feel like the Flagship/Mini-Titan stuff should be part of an optional submod. Sorry, wasn't real familiar with the discord stuff. This one shouldn't expire and it will be a discord with lots of other sins mods hosted by CGB. I'd be interested in more feedback on the flagship concept. Sins of the Fallen is my Favorite Mod, but the Rogue Race is to weak. The Capital Ships Buffs and Damage please fix. Antimatter and Shield Upgrades failed in Tech Tree. Thanks for the feedback. I'll look at the suggestions. Please integrate the Addon Disable Superweapons. I need help. I can not edit Gaminfo Files. I have reinstalled Sins and the Fall of Kobol mod (1.91.50). When I last played there was Colonial Defence Forces, Cylon Loyalists and then the Cylon Rebels and the Colonial separatists races/playable factions. Has this come with and update or has something bugged with my setup? The Cylon feel stronger because the can capture ships. Worldstar is very strong with that if you can invade some heavy basestars. My games with them are easier for me. Are there any playstyle suggestions for the Colonial Fleet? Speaking of the Colonial Fleet... What about the strength/weakness of the 2 Viper classes? Couldnt find info. And what about this stealth bomber vs. Raptor? I am confused about the different fighters. And there is no channel for this or the "fallen" mod in the CGB discord so i dont know where or who to ask. If you ask me, Zombie has stopped working on it. It is still a great mod. Maybe you should look after another game. Can really recommend Endless Space 2. Descent Ai and many different races to play. I really hope that someday Sins III will apear with new great mods. But ... well you know ... Hope dies last ! Its not i havent tried other cames. More 4x oriented like Endless Space 1 or 2 or more action games like Starpoint Gemini Warlords. I like Empire at War too. But after playing all these games i come back to sins because it suits me best. I love it. I love watching the battles, i love it how to research and how i build up my empire. No other game is like this game. I have over 1400 hours of solo play. And i am very thankful to all the modders out there keeping this jewel alive. So maybe he stopped working on it but i had some fun with his mod too and so i thought i try and ask some questions i couldnt answer for myself. It's not that he has stopped working on the mod. It's that he is only one person and only works on the mod when he has the motivation. So what will happen is we will get long periods of silence between updates. Unfortunately, the mod creator has been incommunicado for awhile now. So any actual fix won't be happening anytime soon. But, if you go into the race modules and delete \Window\MainMenuScreen.window files it'll.....kind of work. Mod has been updated and is available on the modDB page.